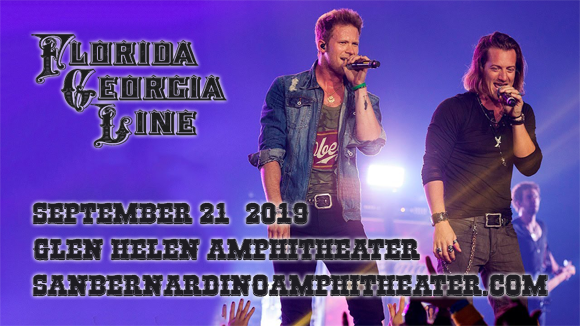 Florida Georgia Line are a non-stop whirlwind of wild country fun and they're bringing their new tour to Glen Helen Amphitheater on Saturday 21st September 2019! The duo will be slamming down fresh new material from their hit album Can't Say I Ain't Country, and with more dynamic stage production than ever before, fans can prepare for the night of their lives! Joining the duo in support will be the incredible line-up of Dan and Shay & Morgan Wallen! American country music duo Florida Georgia Line was formed in Nashville, Tennessee in 2010 and consists of vocalists Tyler Hubbard and Brian Kelley. The pair found instant success with their 2012 debut single "Cruise", which broke two major sales records: it was downloaded over seven million times, making it the first country song ever to receive Diamond certification from the RIAA, and was the best-selling digital country song of all time until 2017, charting at number one for 24 weeks. Their unique take on country music, which takes influence from rock and hip hop and evokes a party mood, has been coined "bro-country" and is thought to have pioneered a genre. The band released its fourth studio album, Can't Say I Ain't Country, in February 2019.